Before my departure to Botswana, I often heard people asking me if I could be living in a hut. Just like many of you, I had never been to Africa and I was unsure of what to expect. What do you think of when you hear "Africa"? I know, with complete certainty, that my ideas of what I would find here is drastically different from where I am living. 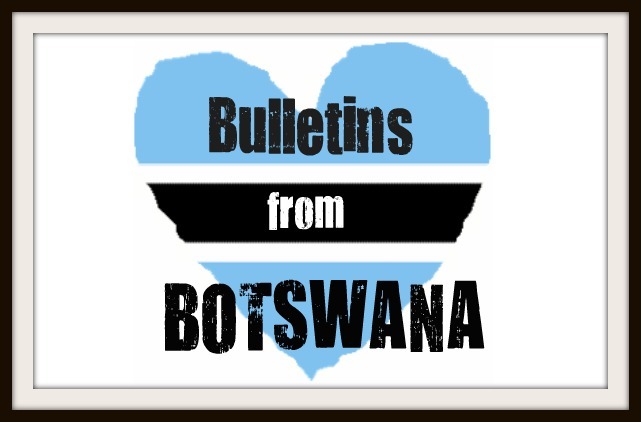 Of course, there are places that are less developed than this great country of Botswana, but I am here to break down some of the stereotypes we might have become accustomed to. I live in a beautiful home which was recently built with running water and wired for electricity . My house is much bigger than I ever expected with a master bedroom, master bathroom, shower (can you believe it!? ), extra bathroom, guest bedroom, living room, dining room & kitchen. Makibikibi, or Keebs, my little furry cat, is in cat heaven with all the space he could dream of to run and play in. All of the floors are tile as well, which makes cleaning them much easier & brings my kitty great entertainment to run, slide & crash into the walls. As I mentioned before, it is incredibly sandy here, so I must sweep and mop quite frequently to avoid sand dunes in my home. I want to share some additional pictures of my house, along with a disclaimer. All of my walls are concrete which makes decorating quite the burden. I've decided that given the limited options for wall hangings, my house looks a bit like a glorified dorm room. Tacky, yet beautiful. I've become quite fond of it. map of states with pictures of family! My gas stove has been connected in my kitchen to allow me to cook, warm bath water, and make tea for my neighbors who constantly drop by for a visit. Before my stove was connected, I was bathing with cold water. It wouldn't be so bad if it wasn't the dead of winter here. After lathering shampoo into my hair, I began to rinse out all of the suds. By the time the third or fourth cup of cold water was dumped onto my head, I had to stop because I had a brain freeze. Never in all of my life has that happened! Needless to say, I stopped washing my hair until I got my stove. I hugged the man who installed it for me; it was impossible to contain my excitement to have the option of boiling water. It's the little things in life, I'm telling you! The electrical box is the missing piece before I get electricity, so until then, I won't have use of the refrigerator sitting so nicely in a box in my kitchen. (With electricity, I will also be able to use a geyser to have hot running water!) I have a system for cooking which seems to be working out alright for me… I make dinner to serve two, eating one portion at night and saving one portion for lunch the following day. Although I don't have a fridge to store leftovers, it stays cool enough at night and even by mid morning, my food is still ok. Yet another reason I am thankful to be a vegetarian! Nothing I cook has much potential to spoil by the second day. P.S. Please notice the random Christmas tree in the corner of my living room, the yellow!! paint on the walls & the beautiful 1980's prom dress curtains. A white Toyota Corolla pulled into the Kanye Education Center around 1 PM, which was already five hours later than we were expecting. Pam, another Peace Corps Volunteer (PCV) and I exchanged a few brief looks of panic before realizing that whether we liked it or not, she and I would soon be crammed into a tiny car for the rest of the afternoon. Drivers were sent from all around the country to pick up PCV's and whenever possible, they tried to bring people who lived in the same region in just one vehicle. This makes plenty of sense, as long as the vehicle is large enough for everyone and everything. Pam & I spent the better half of the morning saying good bye to our fellow Bots 12 PCV's and watching them drive away in big shuttle vans (called khombis), mini school buses, or fire trucks. And there we were, with large piles of our belongings & no alternative solutions coming to mind. You learn to go with the flow here! As we drove away from Kanye, I had mixed feelings about moving onto the next chapter of my Peace Corps Adventures. I was definitely excited about all of the new challenges, but at that time, I still wasn't even sure if I had a house in Kang. With a little bit of faith, I knew things would turn out alright. Bright rays of red and gold sunlight filled the sky as we pulled into Kang. Although I could only see out of one window of the vehicle, I was so pleased to see what little there is to be found in my new village. My heart filled with joy as I realized this new little village will be my home! Our driver took us to the clinic where I will be based and he left me with my supervisor, Dr. Katungu. He was very pleased to meet me and he drove me to my new home in Kang. As I was warned, there is no electricity in my house, so I immediately rummaged through my bags to find the candles and matches I bought earlier that day . Fumbling in the dark was a bit of a challenge, especially since I had never seen the layout of the house before. It turns out that even during the day, I still feel like I am fumbling around. I have been here for a week now, and I am just trying to learn everyone's names and faces. It's difficult to try to figure out exactly what I should be doing here, but that's why I am working on a community assessment. I have two months to talk to community members and clinic staff to gather enough information to write a report about what projects I will be starting in September, based upon the needs of the community. Working on this report feels a bit like trying to complete a jigsaw puzzle with a million pieces painted the same color. :o) I'll work on putting some of the pieces of the puzzle together & I will find where my piece will go as well. Hope all is well with you, I'll write another update again this weekend! As I am wrapping up training in Kanye & looking back on my experiences, it seems as though I have already come so far. Who I am two months ago upon arrival to this beautiful country is drastically different than who I am as I write to you today. Although I have been counting down the days of training, I must admit that I am sad to leave behind my new friends, host family & all of the memories we have made together. We have experienced all the ups & downs along the way and I've realized that joining the Peace Corps has truly taught me to find comfort among all the chaos and insanity that wraps itself around me on a daily basis. Tomorrow is the official Peace Corps Swearing In Ceremony where I will take an oath in front of the U.S. Ambassador, the Botswana Country Director & my peers to solidify my commitment as a Peace Corps Volunteer. Following your dreams isn't always easy & I've definitely found myself questioning whether this is where I should be... but at the end of the day, waking up each morning in Botswana is exactly where I need to be at this point. Sure, I've faced a lot of difficulties throughout the past two months, but I wouldn't trade it for anything. From day one when I first began contemplating whether I should join Peace Corps up until today, it has been a test of patience, self reflection & dedication. There's absolutely no way that I could take an oath tomorrow if my heart wasn't completely sold on the idea & I can say that without a doubt, I am ready to take on all the adventures coming my way in Kang! Pre-Service Training (PST) is coming to a close & new beginnings are awaiting me in my new village. Can't really complain about that, now can I? To wrap up PST, we had our host family appreciation event on Saturday to honor the families who have lovingly taken us in as sons and daughters. My host momma and niece came to the event & they enjoyed eating "American Chili" and learning some traditional American dances. Everyone seemed to really enjoy themselves & we all got a little teary eyed watching the slide show of PST that was put together for us. We've become such a close knit PC family! I will miss everyone very much. Also, I picked up my cat from another volunteer this past Thursday and he has been settling into my room at home. He's a shy cat and he definitely gets freaked out by a number of things, but he is such a sweet heart. He likes to cuddle up with me in bed & purrs as long as my little host niece isn't in my room screaming and running around. Makibikibi will be a wonderful little companion for me & I think he will keep me company throughout some lonely days of transitioning into Kang. My dad is doing much better & he is scheduled to be discharged on Wednesday of this week (same day I am moving)! It will be a big day for both of us. :-D thanks for all the prayers and positive thoughts! My mommy called me yesterday to inform me that our first baby goat was born this weekend and it was really fun to see pictures of the cute new addition to our farm back home. I am also especially thankful for Mia calling me this week from Camp Wapiyapi - I wish I could be there with the kiddos, but it was so touching to hear each of their voices on the other line when they called me to tell me about camp adventures. What fun!